Late last month, Capcom revealed Mega Man Legends 3 for the Nintendo 3DS. The game's executive producer Keiji Inafune said, "I want it to be good, really good." Inafune, however, is leaving the project. At the end of this month, Inafune is resigning from his position at Capcom. "I really don't want to quit now," Inafune tells 4Gamer.net, noting that it has taken time to get the project off the ground. "But, I can't do it anymore. I don't have the willpower. That's why I'm leaving Capcom and recharging..."
Mega Man Legends is apparently Inafune's favorite series in the Mega Man franchise. "We have wanted to create a new installment in this series for a number of years," Inafune said in a video letter last month. "And it is great that we now have the opportunity to bring this title to the Nintendo 3DS." 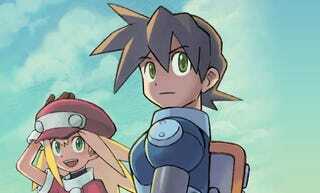 Gamers will have the opportunity to play Mega Man Legends 3 when it is released next year, but Inafune unfortunately won't have the opportunity to see it to completion.